Just in case it had slipped your mind, we've once again reached that time of the month when Nintendo updates the Nintendo Switch Online service's selection of NES games. A total of four new offerings have arrived today (five if you're in Japan), so let's get stuck in. New #NES games have been added to #NintendoSwitchOnline – Nintendo Entertainment System! Wipe out hordes of radioactive mutants in Blaster Master, and seek out the Triforce of Courage in #Zelda II: The Adventure of Link. Elsewhere, 'SP' or 'Special' editions of two previously-released games have also appeared, with Ghosts 'n Goblins and Ninja Gaiden joining the lineup. 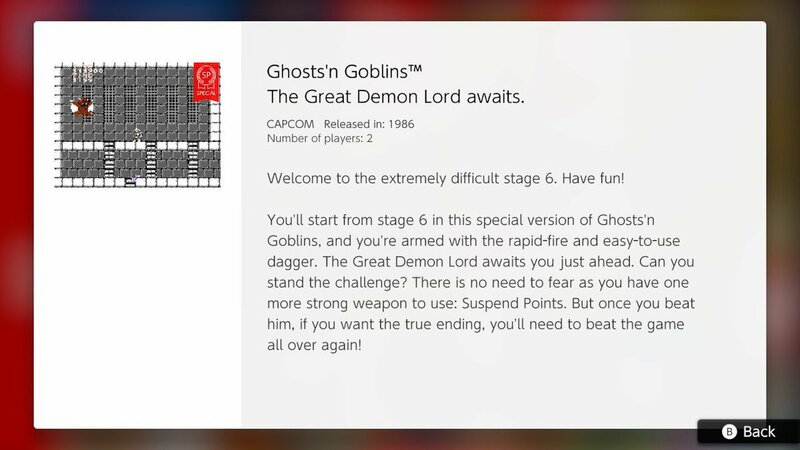 Ghosts 'n Goblins SP throws you straight in at stage six of the game and Ninja Gaiden puts you right before the climax of stage 6-4. Full details can be seen in these screenshots below. Which games would you like to see appear in the coming months? Do you think the SNES game rumours will come true? Let us know in the comments. Punch out!! is really missing. I got the Japanese app today just for Joy Mech Fight and have been having a blast playing it. I don't get these SP versions. Most of these games are really short and if you find them too hard - which lots of them are, then just use your save states to get through. At least you've seen the whole game that way. It would be nice if you could hide them on the app too because having the same art twice looks rubbish. I have spent little more than ten minutes playing the 'free' games since the Nintendo Switch Online service started.However I may give Zelda a go..
As someone who STILL hasnt finished these games despite owning the NES Carts since they came out back in the day, maybe now I'll finally finish them... One can hope. Good games, but should have given Joy Mech Fight to the West as well. Just played Joy Mech Fight for the first time. I didn't know what to expect and was pleasantly surprised. It's really good for a NES fighting game. It looks great and plays smoothly. Since Sukapon appears in Smash, I knew what moves it had. I just had to find the right button combinations. I'd love Duck Hunt with joy-con aiming support. It has to be doable! You don't need to remind us. I think Zelda II deserves another play. I've only been waiting 12 years to give Zelda II another go. Stoked. Both are available on the NES Classic. Difference being once purchased you own said games. I myself haven't been persuaded paying for NSO being the state it's in. Massive fan of the Switch. Zelda II is the only game from the series I've never played (excluding those terrible CDi games of course). Perhaps I should give it go now! Woah, like I haven't played or heard of these before. It's like the equivalent of releasing the 5th special edition of John carpenter's Halloween but without any new bells and whistles, extras or special features. Lol minus the fact that BM isn't THAT great while zelda II is usually devided by Z fans. I've always dug it personally but it wasnt until years later on the wii's VC where i finally beat the game. So much more rewarding and enjoyable in comprison to lets say, wind waker which was a total snore inducing pain in my sail. Sweet box art though and the plot to me was so bizarre and unsettling back when I was a kid. It sticks with you. Ninja gai-DEN! What more can I say, I've beaten this one too. Definitely in the top 10, and possibly even a smidge harder than ghosts n gob's at least towards the final few stages of the game. Castlevania III is another hellian. But for moi personally, adventure island is the the hardest 'functionally playing' cruster i've beaten on the Nes no question. 😮 has anybody else here beaten the original AI on the nes fair and square without using any cheat codes? I hate to say it, but I might actually do the SP Ninja Gaiden. I have played this game on and off for years and years and could never finish the last stage - getting as far as the last boss, but not having enough health to seal the deal. The purist inside me says no, but the old man inside me says I have earned the right to play the SP version - having put so much frustration with that last level over so many years. Zelda II is a good game - I actually never beat that game until the VC version on 3DS. I originally got the game for Christmas the same year it released - but I was never able to finish it until I was an adult. These games are the reason I find most modern games easy. I struggle to play NES games for more than a few minutes. Super Mario Bros 3 is great and I planned to play through it again for the umpteenth time but I got stuck between some blocks and can't move. First time I've come across a glitch like that in a Mario game,it's put me off from playing it any more. I had been enjoying Adventures of Lolo but even that's starting to annoy me now as the difficulty ramps up. I'll give Zelda 2 a go though as I've never played it before. SNES games I can spend hours with, the difference between the 2 consoles is night and day. One thing I find amusing about NES Online, Nintendo don't provide any manuals on how to play their rock solid NES games, expecting their audience to figure it out for themselves (which is fair enough) but then they must think we're not smart enough to figure out what the + button does. Why is there not an option to hide the button prompts, it's surely such a simple thing to add. @sikthvash I might be one if the few here that played and beat the CD-i games. They are tough as nails, too - probably mostly due to bad controls. The Ganon fights are a joke. Honestly, I find them somewhat enjoyable - even if it falls under the “so bad, it’s good” category. I actually wear it as a badge of honor to have played them - mostly because so few have experienced the games. @NintendoFan4Lyf I always wanted to play the one were you play as Zelda. The only other game were she plays an active role in the story, instead of just waiting to be saved, is Spirit Tracks. You could also count Wind Waker and Ocarina of Time, but Sheik and Tetra still mostly appear in cut scenes. @Moroboshi876 You can play Duck Hunt on the WiiU with a Wiimote, but the fact that the cross hairs are visible on the screen makes it way too easy. @countzero If I remember right, you could turn the crosshairs off, but that made it too hard as your remote is not really aiming at the TV, it's aiming at the sensor bar, so it was just off. @countzero There were actually 2 CD-i games where you played as Zelda. Zelda: Wand of Gamelon - which is the animated side-scroller similar to Link: Faces of Evil. 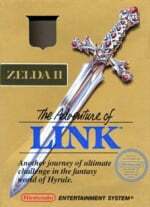 The second is called Zelda’s Adventure that used the traditional top-down perspective and had live-action FMV. The game required the CD-i digital video add-on to be able to play. I never had that for my CD-i, so I never played it. The game was also panned by critics. @countzero Yeah, but unlike most people here I don't want to buy Virtual Console games. I'm fine with this digital renting model, while I like to own the games in my NES Mini (both originally included and added). But most importantly I think the Switch screen is what those games deserve. I've played Zelda II many times over and will happily play it again on Switch. I think it's a great game. I really wish they'd stop with the SP editions. Or do them differently because I don't think we need a different game icon for what is essentially loading a premade save state. How about just including a save state at the end? The layout for the app is starting to look messy, especially with the sp versions being separate from the standards. Could do with a way to organise the games. Would like some basic instructions for games too. Tried the wrestling game and couldn't work out what to do, even with just two buttons. Will probably give Zelda II about 10 mins and then get bored of it, just like all the NES games, I just don't have the connection to them like I do to SNES games. @Moroboshi876 My point is, that it wouldn't be a lot of fun with pointer controls, because it is too easy. Glad to have Zelda II. Still waiting on Super Mario Bros 2, Punchout! !, Kirby's Dream Land, Contra, Super C, Castlevania, Castlevania III, Double Dragon II, 1943, Star Tropics, and Star Tropics II, not to mention the fabled SNES games, but I refuse to get my hopes up. @countzero But what if the pointer didn't appear on-screen? I mean using joy-con as the Zapper. At least they are trying to make up for missing US games. Another 2 wasted slots for the SP version, essentially it's the last level but you're powered up to the max. Should have had them as separate modes within the regular game. It's sad that I'm more interested in playing the "special edition" games but for good reason. I never could finish Ninja Gaiden or Ghost and Goblins. And yet I beat Silver Surfer. That game gets a bad rap but the game was good and the music was amazing. Can't count how often I startet Zelda 2 without finishing it. Maybe this time!? It's the only Zelda game I've never beaten so it has to be done! 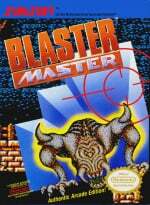 @Moroboshi876 The Zapper (or any old school light gun) could actually detect if you were pointing it a correct part of the screen when shooting. The Wiimote only detects the sensor bar, so it doesn't know how big your TV is. The pointer on the screen doesn't actually match with were you are pointing the controller. The Joy Con doesn't detect anything. You point it at the center of your screen and press a button to calibrate it. Then it calculates the position of the pointer just by reading the motion sensors. You could point it away from the screen during calibration and it would still move the cursor according to your hand movements, but if you point it at the screen again afterwards it would stop working. @countzero I understand the technology changed (thanks for the info, though), but couldn't we agree on that there should be a way to make shooting games again, in modern systems, and maybe tweak old shooting games' controls in order to make possible playing Duck Hunt on Switch? I have only been playing Mario and Zelda and only the first I would consider to still be a replayable classic. Zelda I played mainly for nostalgic reasons. Even that game aged really poorly. They should bring SNES and Gameboy over, really. Hm, they drop you at the end of the 1st loop of Ghosts N' Goblins. That's subtly evil, I'd say. @ryando Highlight a game and press Y. You can move them and reorder them to your liking. Why do they keep making these SP nes edition with girlfriend mode? : S They should spend more time getting more content on that damn service. @Medic_alert I'd also love to be able to hide the special games. At the moment I just have em at the bottom of my list, but with two more this month they're kinda starting to pile up. @Medic_alert They should be under a separate menu. This is straight up sad compared to how other companies are bringing their retro games to switch. @Medic_alert I move all of my SP editions to the bottom row. I wish I could hide them too, haha. Looking forward to trying Zelda II again. It's been, what, 25 years since I couldn't really handle it, plus a brief attempt on small 3DS. I've always been sad I've never played it through, but it was too obtuse for me back when it launched on NES. Getting our old VC games on switch could be so simple. Take an sd card and back up your VC on 3ds or wiiu, drop the card in your switch, BAM it loads up your nes, snes, GB, GBA etc VC! @Medic_alert Probably for younger players. The Zelda one sounds vary useful though, since I haven't played any of these games, some are kinda intimidating, so I think it's great! @Moroboshi876 They should make it so we can point the joy-con at the screen to shoot. I too have been playing this game on and off since the 80's. I can get to the final boss but I can't finish it. It's also brutal in the fact that you really need to beat the boss the first time. If you die, you don't just go back to the beginning of the level like other bosses. You go back to the beginning of the stage. It's BRUTAL! @GamingTelescope That. And I wonder how difficult that would be. I think it's hilarious that people want to hide the SP's! Really? Is it that big of a problem? The program allows you to sort and highlight your favorites. But, to be fair, I think Nintendo could easily include a feature to hide games if the users chooses. I personally have not tried the SP's yet but I think they're great. Games from the 80's were a challenge. Sometimes a great challenge that was both fair but tough. Others though, were cheap. 410 games across 3ds and wiiu VC and this is what subscribers are paying for? Yes, I agree. I would also like to put the games I finished in some kind of "completed folder". If more games keep coming it's going to start getting harder and harder to find what you want. I imagie not too hard. Remember when hackers found NES golf on the switch which supported using motion controls? @GamingTelescope the save states make these games easy enough. I played both Zelda 1 & 2 at 9 years old and finished both. If anything these old games are more suited to the young - fast twitch reflexes, time on your hands to learn a game by heart and the lack of taste to know there are far better things to be playing! I for one would not recommend Zelda II The Adventures of Link to anyone. It's really hard in an unfair way, it has annoying random battles, it encourages you to grind those random battles to get through the game and it is generally just a mare to play. While other Zelda's stood the test of time this one just bleurrgh! @gokev13 my ideal would be to be able to take the ones I want out the app and put them on the main switch screen. Having the artwork for those old games in amongst my library would be great! Thanks to these additions, I played Zelda II. I never had the chance to play it, and so far I'm having fun with this one. The side scrolling sections are different, but fun. I have never played it either. @GameOtaku You bought all 410? Wow! I bought on 3ds at least 90 so it's up there. But they are games I own, no time limit attached, no need to buy them again and no games that is never touch either! Yes, we could just download the Famicom Service, but there's a plot that's written in Japanese, and I'm not so versed in Japanese! Come on Treehouse, you could've translated it, and made the service more interesting for us by releasing a title us westerners haven't seen before! Can’t really get on with the original Zelda but willing to give 2 a chance and see if it’s as bad as people say. 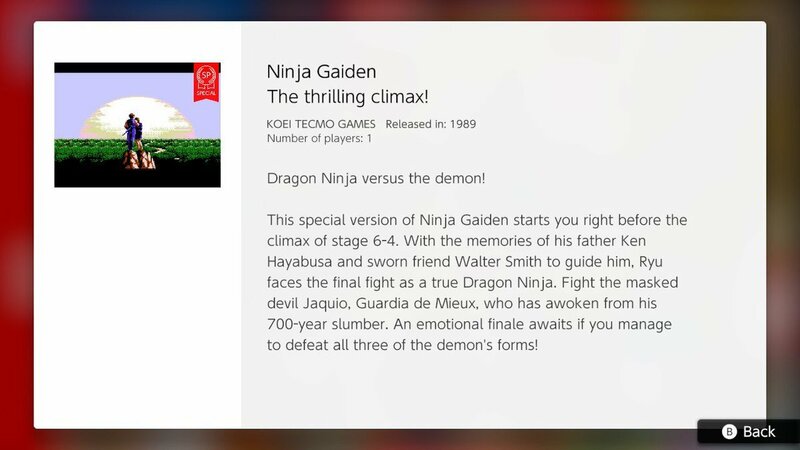 I haven't tried the one for Ninja Gaiden yet, but if I read correctly, this lets you start off right before the boss and presumably at full health. That could be really handy for practicing against the final boss since losing to him even once sends you back to like 6-1. @Illusion they have the double dragon II arcade game for the Eshop. That would be sweet. Of course folders and themes in the main screen would also be great. @WaveBoy Are you saying Ninja Gaiden is harder than Ghosts n Goblins? Can be, yeah. Especially towards the end. There are a few unfair spots in NG topped off by a couple of grueling final boss battles that will have you yanking your hair out. NGIII is still the hardest of the trilogy, limited continues are partially to be blame. I've beaten all 3. Surprise! Ghosts n goblins correct if I'm wrong gives you unlimited continues and when you die you start right back at the beginning of the stage. Towards the end of NG, if you lose all your lives at the final boss you THEN have to start 3 levels backwards all over again. Ahhh, NG. The first time i ever experienced(along with many) cut scenes in a video game or a game that had an actual fleshed out-ish story that took you on actual Rollercoaster ride vs the majority of other games during the time. 2 excellent games added here but Nintendo needs to stop the drip feeding as 2 games a month isn't enough. As for Zelda 2 it is one of my favourites in the series and one of the best games for the system which was well received at the time. I have no interest in the SP games but can see why they are there having witnessed my stepson attempt to play these classics, it shows how easy modern gaming really is. For me though I get no satisfaction in beating these easy/short versions and only use save states at the beginning of a stage as some kind of modern password for when adult life gets in the way. Today I learned that Ryu's father is Ken. @GameOtaku If those things are important to you, great. But you also spent several hundred dollars on them, whereas I'm spending only $20 a year, so it's not really a fair comparison. Of those games you are renting from the service how many will you actually play though? Probably not even half, my self I'd never touch any of the sports titles or most of the puzzlers. Most of the games j bought were usually on sale, but even then I can play the games at my own leisure and not have to worry about lapsing my subscription. Paying once and owning indefinitely sounds far more appealing than renting a hodgepodge of games you'd never play. Do the math, in 5 years you'd easily spend $100 on rentals. If you play online everyday then this service may be for you. But to lock it only to those who play online is ridiculous. They stand to make more money from individual sales (and its help Nintendo know what games or types of games to add). @sikthvash Burn:Cycle is the best game for CD-i (and is also surprisingly superior to the PC version). The rest of the library is either available elsewhere or just not that great. Wacky World of Miniature Golf is pretty fun - but took a lot of trial and error to understand that the game is still very much an FMV game and requires you to hit the ball at the right time to get a desired result. Kether was interesting, but hard for a kid to understand. You had to pick a temple to go to and then fly through a gauntlet of enemies and obstacles. Once you finally got to the temple, you had to solve a not-well-explained puzzle to get into the temple. Once in the temple you had to go through a labyrinth and do...I don’t even remember. It was all very abstract sci-fi - very arthouse. @WaveBoy Well, I have finished Ninja Gaiden and only the last few stages are difficult. And once you learn them, it isn't really that hard. Ghosts n Goblins on the other hand I find insanely frustrating, and I never even beat the first run-through. Maybe I should give it another go. As for NG3, I hope they put it on the Switch eventually so we can play the Japanese version with unlimited continues. i dont get these sp versions either.